To enhance synthetic operations on Microsoft Windows and shared folder backup repositories, Veeam Backup & Replication uses the Fast Clone technology. Fast Clone lets you create synthetic full backups and GFS backups without moving data blocks between files. Instead, Veeam Backup & Replication leverages the spaceless full backup technology and references data blocks that are already present on the volume. Fast Clone increases the speed of synthetic backup creation and transformation, reduces disk space requirements and load on the storage devices. Fast Clone is based on Block Cloning. Block Cloning is Microsoft functionality available on ReFS 3.0. Block Cloning allows applications to quickly copy data blocks between different files or within the limits of one file. When an application needs to copy data, the file system does not physically copy data on the underlying storage. Instead, it performs a low-cost metadata operation — it ‘projects’ data blocks from one region on the ReFS volume to another one. Block Cloning increases data copying performance as the file system does not need to read/write data from/to the underlying storage. It also helps reduce the amount of redundant data. For more information, see Microsoft Docs. To configure a backup repository with Fast Clone support, you must use the repository that resides on Microsoft Windows 2016 Server (and later), Microsoft Windows 10 Pro for Workstations, or shared folder SMB 3.11. Veeam Backup & Replication automatically detects if the server or shared folder meets the specified requirements and if Fast Clone can be used for work with data stored on this backup repository. Fast Clone requires that the starting and ending file offsets are aligned to cluster boundaries. For this reason, Veeam Backup & Replication automatically enables the Align backup file data blocks option for backup repositories that support Fast Clone. Data blocks are aligned at a 4KB or 64 KB block boundary, depending on the volume configuration. Manual gateway selection: Gateway server. Automatic gateway selection: Mount server associated with the backup repository, or backup server. For reverse incremental backup chains, Microsoft Windows 2016 or Windows 10 Pro for Workstations must additionally be installed on backup proxies assigned for the job. [For direct data transport path] Mount server associated with the backup repository, or backup server. [For data transport path over WAN accelerators] Microsoft Windows 2016 (and later) or Microsoft Windows 10 Pro for Workstations on the target WAN accelerator. Due to Microsoft limitations, all backup files in the backup chain must be stored on the same volume. For more information, see Restrictions and Remarks at Microsoft Docs. By default, Veeam Backup & Replication uses Fast Clone for all backup repositories that meet the specified requirements. You can disable this option with a registry key. For more information, contact Veeam Customer Support. 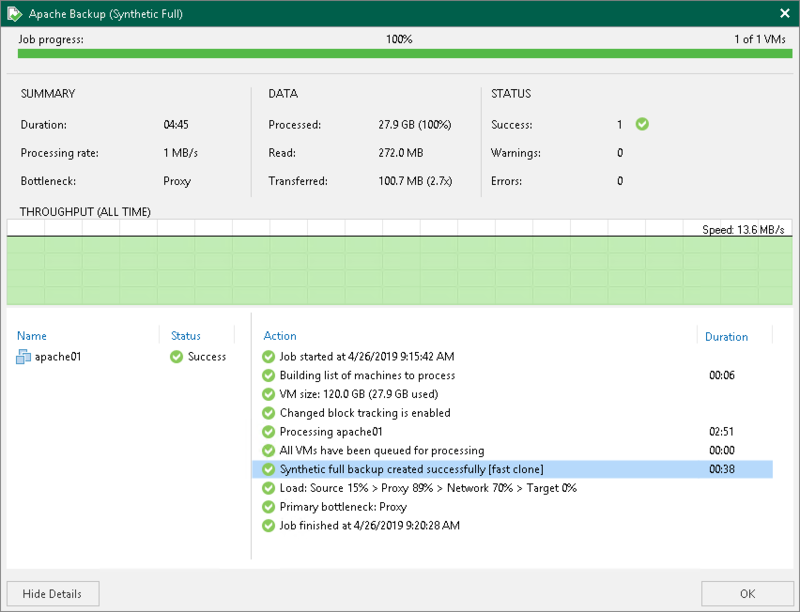 When Veeam Backup & Replication performs a synthetic operation with Fast Clone, it reports this information to the session details for this operation. Veeam Backup & Replication does not use Fast Clone for backup repositories configured with previous versions of the product. After upgrade, such backup repositories will work as backup repositories without Fast Clone support. To leverage Fast Clone, you must remove such backup repositories from the backup infrastructure and add them once again. Fast Clone requires that source and destination files are stored on the same ReFS volume. If you add a backup repository with Fast Clone support as an extent to a scale-out backup repository, make sure that you enable the Data Locality placement policy for this scale-out backup repository. If backup files are stored on different extents, Fast Clone will not be used. If you move backups to a backup repository with Fast Clone support, you must perform active full backup for all existing backup chains (manually or automatically by schedule). You can also schedule the backup file compact operation instead of active full backup. Veeam Backup & Replication enables the Align backup file data blocks option for backup repositories with Fast Clone support after backup repositories are created. When you pass through the New Backup Repository wizard, the Align backup file data blocks check box is not selected by default. 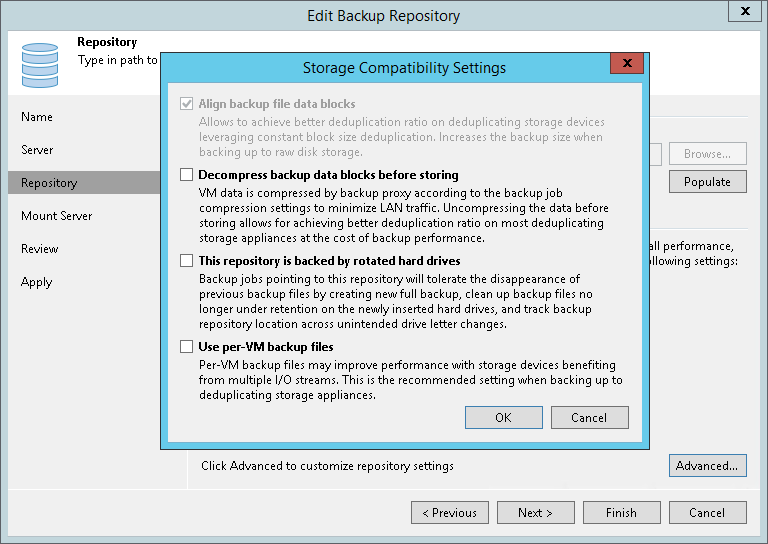 You can either select the check box or leave it empty – Veeam Backup & Replication will enable the option anyway. When you copy data from a ReFS volume to another location, the file system downloads cloned data blocks. For this reason, copied data occupy more space in the target location than it used to occupy in the source location. This can happen, for example, if you evacuate an extent that supports block cloning from a scale-out backup repository and migrate VM backup data to another extent: copied data will require more space than it originally took. Fast Clone and Windows data deduplication cannot be used simultaneously. Thus, if you target a backup job to a repository supporting Fast Clone and enable Windows data deduplication, the Fast Clone technology will not be used for this job. If you target a backup job to a CIFS ReFS repository and enable Windows data deduplication, the job will fail. Veeam Backup & Replication does not support such scenario.